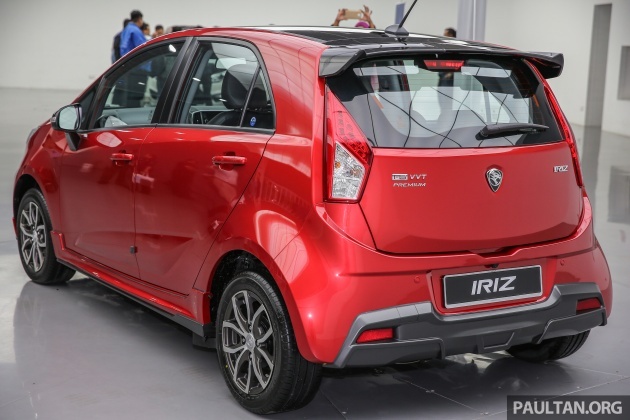 After showing the car at DRB-Hicom Autofest last weekend, Proton held a media preview of the updated Iriz, where it released full details of the improvements made to the B-segment hatchback for the 2017 model year. We’re previously reported on the streamlining of the entire range – before this, the Iriz was offered in 1.3 Standard, 1.3 Executive, 1.6 Executive and 1.6 Premium trims, all of them available with either a five-speed manual transmission or a CVT. Now, the 1.6 Executive has been dropped, and the manual gearbox option is only offered on the base 1.3 Standard, cutting down the total number of variants from eight to four. Only the range-topping 1.6 Premium gets the two-tone exterior colour scheme seen here, with a Quartz Black finish on the door mirror caps, roof and spoiler. However, all models gain a gloss black front grille garnish, as well as the new Proton badging introduced on the Perdana. There are also new Ruby Red and Carnelian Brown paint options – the previous hero colour, Citrus Green, has been dropped. Inside, there’s new fabric upholstery with blue and red stripes that bear a striking resemblance to Martini racing liveries, along with red stitching. Other improvements have been carried over from the Persona include a redesigned instrument cluster with an ECO Drive Assist indicator for CVT models, as well as a new gearlever with a side-mounted unlock button. There are new, less slippery floor mats, too. Meanwhile, the Premium model switches from full-leather to part-leather trim with the aforementioned stripes, and adds red stitching on the steering wheel and carpets. Gloss grey coats the previously matte centre console and gearlever surrounds, and the instrument cluster shroud is now finished in gloss black. Also limited to the Premium model is a new touchscreen infotainment system with Smart E-Link smartphone screen mirroring. Unfortunately, features such as automatic headlight activation, auto-folding door mirrors and the auto-up function for the driver’s side window have been removed from the Premium’s kit list. 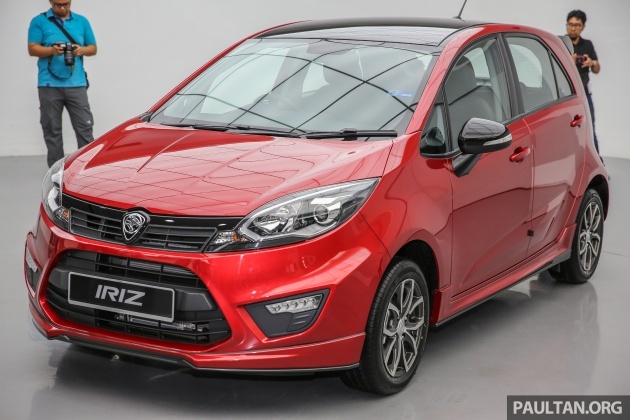 More discernible changes can be found under the skin, where Proton has given the Iriz a number of noise, vibration and harshness (NVH) refinements. These include a reduction in the number of engine mounts from four to three, a new exhaust system from French supplier Faurecia and higher-quality sound insulation. 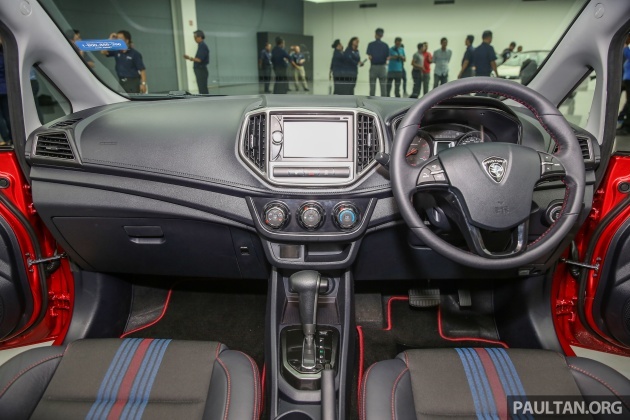 The company claims that with all these improvements, the Iriz is now five decibels quieter than before. Engine choices remain identical, with the 1.3 litre VVT four-cylinder engine continuing to produce 94 hp at 5,750 rpm and 120 Nm of torque at 4,000 rpm, while the 1.6 litre mill pushes out 107 hp at 5,750 rpm and 150 Nm at 4,000 rpm. However, Proton has retuned the engine control unit (ECU) and the CVT’s transmission control unit (TCU) for a quicker, more linear response. Equipment count on the 1.3 Standard is the same as before and includes projector headlights, LED tail lights, 14-inch alloy wheels, fabric seats, reverse sensors and a 2-DIN radio/CD head unit with Bluetooth connectivity, USB and auxiliary ports and four speakers. The 1.3 Executive now receives front fog lights, keyless entry and push-button start on top of a bodykit, rear spoiler, body-coloured door handles, rear wiper, rear seat USB chargers and adjustable rear headrests. As before, the 1.6 Premium throws in LED daytime running lights, a dual-tone bodykit, a larger rear spoiler, 15-inch two-tone alloys and steering wheel audio controls, along with the other bits mentioned earlier. Safety kit has been left unchanged, with dual airbags, ABS with EBD and brake assist, stability control, hill-start assist, front seat belt reminders and ISOFIX child seat anchors at the rear. The 1.6 Premium also gets side and curtain airbags (making it six airbags in total) and seat belt reminders on all seats. LMAO no auto headlights & auto fold mirrors? No time for those features after kuih lapis, tido & fesbuk. Remember 2015 myvi facelift, P2 removed the projector headlight from the 1.3 model and they removed the optitron meter cluster from the 1.5 models. Let’s not pretend that P1 is the only one guilty of removing features. Perodua removed from the facelift version and its in their brochure. Not loke proton send car with tether hook to get a better safety rating and removed it in the production model. P2 never mention for once that their cars got VSC. not to miros, not to ancap and certainly not to the public. Only Proton does despicable thing. Somehow these features not so welcome by customers, so delete and oso save cost. Gojes! State of the art Geely creation. Red color, breathtakingly beautiful like Mazda & Tesla Red. Love the Iriz design inside and out. However pretty sure it’s CO2 emissions are high and seriously, Proton could save cost’s by adopting Andriod Auto and Apple Car Play instead of developing their own system. Android auto original from the US is ok but those supplied by local company tak boleh pakai. You do know Android Auto is a software and there’s no ‘original’ or ‘fake’, right? The user-friendliness or lack thereof usually lies with a headunit’s base operating system and how well is the integration between the two systems. Even if Apple CarPlay or Android Auto were to be incorporated, a separate operating system for the infotainment system would still need to be developed. The two don’t replace the base system – they only take over once the phone is plugged in, and even then only after the user selects them. No details on the pricing? 6 airbags is the plus point here. Nobody wants an outdated VVTi Campro. Better wait till Geely is elected to the board & see what it has in store for P1.